Horse drawn twin cylinder manual fire engine. The engine is red and gold, with cast bronze decorative reliefs, original handles, cast ball and claw feet supporting a lock twin-table, a long nozzle, hub and hose keys, horse shaft and tees, lock bar and flat suction filter. There is a presentation plaque on one side. It is made by Merryweather and G.H. Casentini, 1862. It has two oil lamps by Miller and Sons of 179 Piccadilly. 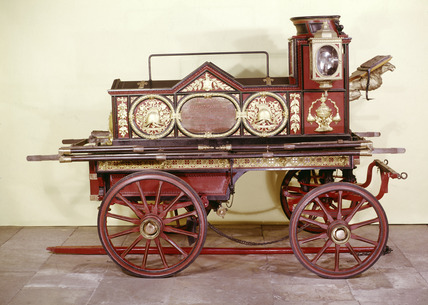 The engine was presented by the people of Lambeth to George Frederick Hodges of the Lambeth Distillery for his services to firefighting, and later loaned to the Brighton Fire Brigade. This engine was known as the 'Testimonial', and is referred to in the report on fires attended by Hodges in 1862 .This report refers to it as one of the three most powerful fire engines in the metropolis at the time. The engine was exhibited at the International Exhibition of 1862.